©Bert Gildart: Last week Janie and I joined daughter Angie and her husband Will Friedner and my granddaughter Halle Mae on a camping trip into what I like to think of as one of the most storied valleys in all of Glacier National Park. While hiking and learning a little something about grizzly bears (see photo of Halle below), we also learned a little about the significance of place names. To set the stage, I rose early one morning when the Two Medicine Lake was perfectly calm and photographed one of my favorite mountains in the park, Sinopah. Because it was one of the most perfectly calm and reflective mornings I’d seen in a long time, the scene called for the detail offered through the use of a 4×5 view camera. Though I can make wonderfully clear photographs with my Nikon D-200 up to 24 inches, with the 4×5 I can sell mural size photographs. Referring to Sinopah, the center mountain in my reflection photograph, you can see that there are many mountains that surround it. These include Painted Teepee, Lone Walker and Never Laughs. Sinopah was the daughter of Lone Walker, who belonged to a Piegan Indian Tribe known as Never Laughs, and he gave her in marriage to Rising Wolf. 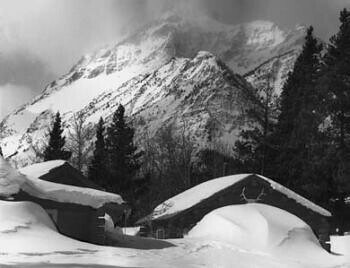 Rising Wolf, the mountain, is the backdrop for the now dismantled ranger station, shown below as a black and white image. The mountain is to the right of Sinopah-but not so far that a narration would lose its focus. I learned about the relationship of the people for whom these mountains were named during a cross-country ski trip in 1968 with two other rangers. At the time, I was attending college in Bozeman, Montana, working seasonally in Glacier and the trip was made during our spring break. One of the rangers, Jerry DeSanto, had brought with him a flask of wine and I recall that we sat around an old pot bellied stove and listened to him recount the stories. Jerry had completed all but his thesis for a doctor’s degree, but decided not to finish as he really wanted to be a ranger, not a college professor. However, his interest in history remained–and for that matter, still does . Two Medicine Ranger Station once served as a layover for rangers patrolling the east side of Montana’s Glacier National Park. Rising Wolf Mountain, one of the park’s more famous monoliths, provides a backdrop for this turbulent winter scene. 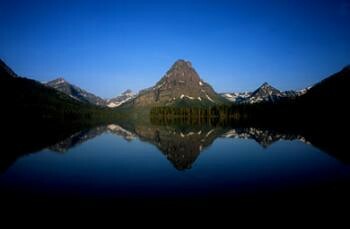 Rising Wolf, the mountain, was named for Hugh Monroe, one of the first white men to see what is now Glacier Park. The Blackfeet [Indians] named Monroe “Rising Wolf” (Mahkuyi-opushsin, “The way the wolf rises”), and he (Rising Wolf) married Sinopah (Swift Fox). Her name is celebrated by the mountain in the first photograph above. Monroe/Rising Wolf died in 1892 at the age of 93 and he is buried at Holy Family Mission near Browning, Montana. Meanwhile, the ranger station provides little more than past recollections of the splendor of a Montana winter, for the buildings were removed about 25 years ago, shortly after I photographed the setting. Subsequently, the photograph has been published about 20 times in magazines, newspapers and books-whenever print media wants a picture that epitomizes a Montana winter. It was also purchased by Montana Magazine from my Christmas line and used one year by publisher Rick Graetz as his Christmas card selection. Not to undermine a good story with commercialism, but the Christmas card is still available and carries the above story. The setting will always be one of my favorites, and I was pleased that I could explain the meaning behind Glacier National Park’s Many Storied Mountains for my granddaughter Halle Mae. This entry was posted on Tuesday, September 11th, 2007 at 3:39 pm and is filed under Glacier National Park, Natural History/Conservation. You can follow any responses to this entry through the RSS 2.0 feed. You can leave a response, or trackback from your own site. Thanks for the background on my favorite mountain in Glacier, Sinopah. There is something mystical in the Two Medicine valley; maybe not the most awe-inspiring view in the park, but to me, incredibly compelling. Beautiful picture. Thanks again. Long time. Stumbled upon you here. But really?–Many-storied? So where have all the years taken you? Greg, the term “Many Storied Mountains” is not unique to you, if that’s what you’re implying. I’ve heard the expression used many times. I know you wrote a book decades ago, but I have not seen it in years. However, if that was the TITLE let me know and next time I use the expression, I’ll mention you.